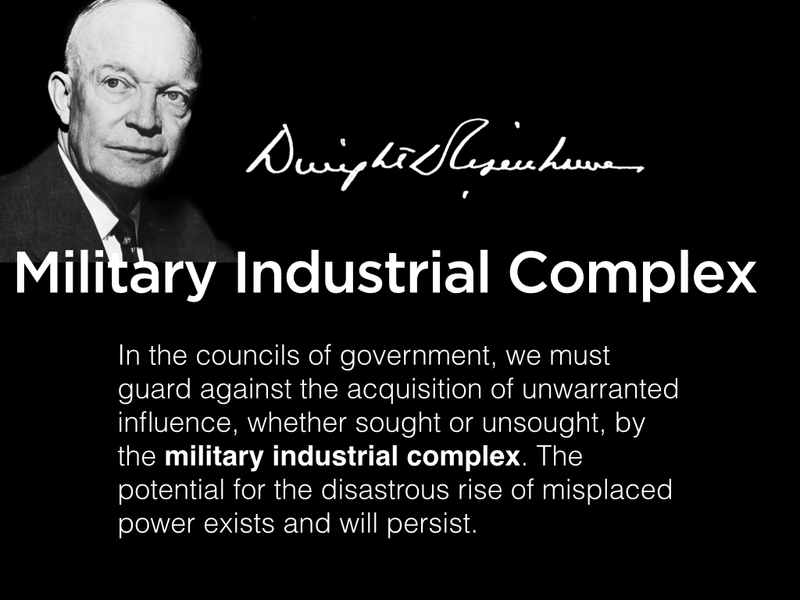 When President Dwight D Eisenhower gave a Presidential address to the American Nation on 17th January 1961 (https://youtu.be/8y06NSBBRtY) he warned them about the rise of the growing menace of the Industrial Military Complex for the whole world. Yet look how far this industry has developed in the 21st century? You can then begin to see what a huge money spinner this industry of human slaughter is for everyone concerned and this is before we look at all the service industries that support it. We are also seeing the increased use of civilian operators, from private weapons companies, using their technical expertise to work alongside military personnel in theatres of war across the globe. Most notably in the use of drones. When one looks objectively at the Global Industrial Military Complex we can see that it has nothing to do with maintaining World Peace or keeping us all safe. Rather it has the opposite, destabilising effect on the whole world. It is heavily weighted in favour of the few, not the many, because the motivation and agenda that pushes it is driven ultimately, as I see it, by power, money and greed. There is a strong ‘evil’ or negative spiritual aspect which can be viewed as nothing less than a ‘blood lust’ that is not human. I believe St Paul hints at this in his epistle to the Ephesians in the quote that starts this blog. Despite what anyone tells you; it is not ‘natural’ to kill anything and it does not come easily for most human beings. If we had to personally kill the meat we eat many of us could not do it. The military on the other hand are ‘taught’ to kill and most of humanity has been brainwashed, pushed and forcibly coerced into doing this. From studies conducted it has been found that in war it is only 12% of the military that does the killing see the link below. “My pacifism is an instinctive feeling, a feeling that possesses me because the murder of men is disgusting. My attitude is not derived from any intellectual theory but is based on my deepest antipathy to every kind of cruelty and hatred.” Einstein. My name is Duncan Clarke trained for the ministry at Wycliffe Hall Oxford and Ordained in the Church in Wales in 1978. Over the years I have worked in many places; as a USPG missionary in Trinidad and as a prison chaplain. At present I am Vicar of St Ambrose Church in Leyland; I am a member of APF and deeply committed to world peace and the elimination of war.